It was not a great surprise that the FDA's new cephalosporin livestock rules have the Agribusiness Seal of Approval. It was Big Pharma and Agribusiness lobbying that killed its stronger cephalosporin rules issued four years after. "We thought the original order was too broad and unnecessarily prohibited uses that were not likely to cause problems for human health," said the American Veterinary Medical Association's Dr. Hoang, who testified in 2008 that the reduced feed antibiotics make possible is a "health-promoting" effect and a "therapeutic use," for animals. What? The FDA's new rules for cephalosporins no longer ban the antibiotic but limit "large and lengthy dosing in cattle and swine," says the New York Times. They also allow uses "the F.D.A. has not specifically approved," and wide use in ducks and rabbits. Yum. In December the FDA also scrapped its three-decade long effort to regulate the use of the popular human antibiotics penicillin and tetracycline in livestock. Still, the new rules prohibit one unsavory factory farming practice that few are aware of -- the "routine injections of cephalosporins into chicken eggs." In 2008, while inspecting egg operations, the FDA caught hatcheries injecting cephalosporins directly into chicken eggs, "rather than by the approved method of administering the drug to day-old chicks." The same year, Tyson Foods was caught injecting eggs with a different antibiotic, the human antibiotic gentamicin, linked to serious side effects. Tyson especially had "egg" on its face because the previous year the government disallowed its slogan "Raised Without Antibiotics," because the ionophores it adds to poultry feed are antibiotics. Ionophores are antibiotics added to poultry and cattle feed for the same "feed efficiency" as produced with other antibiotics, but they are not used in humans. Tyson had just backpedaled into the new phrase, "Raised Without Antibiotics That Impact Antibiotic Resistance In Humans," when it was caught playing fast and loose with gentamicin. Oops. The abuse of antibiotics on farms was one of the late Sen. Ted Kennedy's (D-MA) last stands. "It seems scarcely believable that these precious medications could be fed by the ton to chickens and pigs," he wrote in a bill called the Preservation of Antibiotics for Medical Treatment Act of 2007 (PAMTA), which has yet to pass. "These precious drugs aren't even used to treat sick animals. They are used to fatten pigs and speed the growth of chickens. The result of this rampant overuse is clear: meat contaminated with drug-resistant bacteria sits on supermarket shelves all over America," said Kennedy years before this month's report on MRSA-contaminated pork. The meat industry, "is rampantly misusing antibiotics in an attempt to cover up filthy, unsanitary living conditions among animals," echoed Rep. Louise Slaughter, (D-NY), who cosponsored the bill and holds degrees in microbiology and public health. More than 70 percent of antibiotics go to livestock, not people, says the bill, and they are used on more than 83 percent of grower-finisher swine farms, cattle feedlots, and sheep farms and found in 48 percent of U.S. streams. Of course, it's no surprise that Big Meat denies the dangers of antibiotic resistance and/or its part in it and opposes PAMTA. "We don't believe we are the main cause of antibiotic resistance," Dave Warner, the National Pork Producers Council's communications director told Johns Hopkins Magazine. Doctors who overprescribe antibiotics are the culprit, says Warner, since "There are only 67,000 pork producers." Only? The chicken industry also pleads innocent. "We believe our use is responsible and limited," Richard Lobb, public relations director for the National Chicken Council, told the Hartford Advocate. What is a surprise is that Big Pharma, supposed medical professionals, is also "flat earth" when it comes to antibiotic resistance. Elanco, the animal division of Eli Lilly, says that, "Monitoring antibiotic resistance in raw meat products is not an appropriate measure to represent the bacteria that reach the consumer," in an online brochure recently taken down, "because cooking destroys these bacteria, and dead bacteria cannot transmit antibiotic resistance." Plus -- who minds germs in their food if they're dead? Elanco also asserts, in the brochure, that livestock antibiotics keep occurrences of "food poisoning" down, as if food poisoning were unrelated to farm conditions! 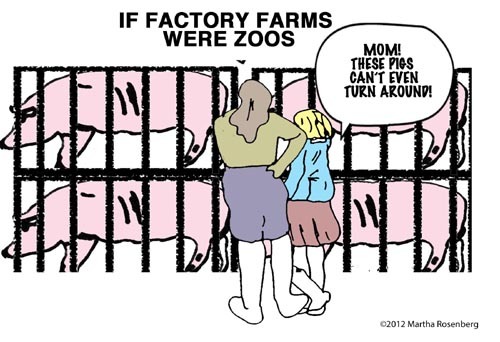 In fact, the size and industrialization of U.S. factory farms is such a factor in food poisoning; it drove the passage of new federal food safety laws in 2010. The Animal Health Institute, representing Abbott, Bayer Healthcare, Boehringer Ingelheim Vetmedica, Elanco/Lilly, Merck, Novartis, and Pfizer is even more flat earth. "There is no scientific evidence that antibiotics used in food animals have any significant impact on the effectiveness of antibiotics in people," it deadpans in a brochure created specifically to oppose PAMTA. "People would be more likely to die from a bee sting than for their antibiotic treatment to fail because of ... resistant bacteria in meat or poultry." But the Centers for Disease Control and Prevention reports that hospital-associated infections, which are likely to be antibiotic resistant, cause or contribute to 99,000 deaths each year. Fewer than 100 people die a year from all stinging insects. And the AVMA? "At the heart of this discussion is the premise that the use of antibiotics in animal agriculture directly contributes to bacterial resistance in humans," says the vet group, urging its members fight PAMTA. A livestock antibiotic ban in Denmark, "has not shown any clear declines in antibiotic resistance patterns in humans," says the AVMA, though CBS News and Food Safety News find otherwise. Antibiotic resistant intestinal infections increased in Europe after certain antibiotics were introduced on farms, reported CBS. But after Denmark declared a ban, it "drastically reduced antibiotic-resistant bacteria in animals and food." The Denmark's Ministry of Food, Agriculture and Fisheries reported that the ban resulted in "overall reductions of antimicrobial resistance countrywide," said Food Safety News. Nor is the AVMA the only veterinary group that sides with industry over animals. The American Association of Swine Veterinarians was one of the groups filing a friend-of-the-court brief supporting January's Supreme Court ruling, National Meat Association v. Harris, that overturned California's humane slaughter law. The law was enacted after the 2008 Westland/Hallmark school lunch meat scandal in which cows too sick and weak to walk were videotaped forklifted and "water-boarded" to the slaughter line. The humane slaughter law prohibits buying, selling or receiving downer animals and processing, butchering or selling them for human consumption. It requires non-ambulatory animals to be immediately euthanized. Big Meat and its veterinarians argued the California law "criminalizes" the work of federal slaughterhouse inspectors who are presumably preventing slaughterhouse atrocities without the California law's help. But former USDA inspectors Lester Friedlander, DVM, and Dean Wyatt, DVM, have testified that federal inspection is a mockery that puts the public at risk at the same time it permits appalling animal abuse. In fact, antibiotics form such a huge part of Big Pharma revenues, antibiotic resistance literally divides medical professionals along species lines. Many medical groups, including the American Medical Association and the American Public Health Association, support PAMTA out of concern for patient infections while big veterinary groups tend to oppose it. At first it looked like PAMTA might have a friend in the FDA's newly-appointed Deputy Commissioner, Joshua Sharfstein, M.D., who was a pediatrician and the former food safety staffer for Rep. Henry Waxman (D-CA). Both he and the newly-appointed FDA Commissioner Margaret Hamburg, M.D., had public health backgrounds and were not industry insiders. At a 2009 House Rules Committee meeting, Sharfstein surprised lawmakers by indicating that the FDA supported PAMTA. The ag lobby was enraged because Sharfstein's remarks implied White House Office of Management and Budget approval, yet there had been no briefing. But by early 2011, Kennedy had died, Sharfstein had left the FDA abruptly and without comment and Big Meat had already showed lawmakers where they could put their cephalosporin ban. Congress seemed to have little appetite left, pun intended, to go up against Big Meat. So it's no surprise that in 2012, the FDA is waving through major livestock antibiotics, attaching Mickey Mouse restrictions on others, and U.S. meat is full of superbugs -- even meat labeled "raised without antibiotics." For more by Martha Rosenberg, click here.